Along with skipping happy hour and saying sayonara to sushi, you know there are certain skin-care ingredients and treatments that are off-limits when you're pregnant. That's because they might be harmful to your unborn baby or there's simply not enough evidence to prove that they're completely safe. But what you may not realize is that many of these same skin-care rules apply when you're trying to conceive. Whether you're thinking about trying to have a baby or are actively working on it, here are the key changes you'll need to make to your skin-care routine to keep you and your baby-to-be safe and healthy. Moles can change, darken, and enlarge during pregnancy, so it's best to have your dermatologist do a skin check—including full-body photos and mole mapping, if you have several moles—before you get that BFP. 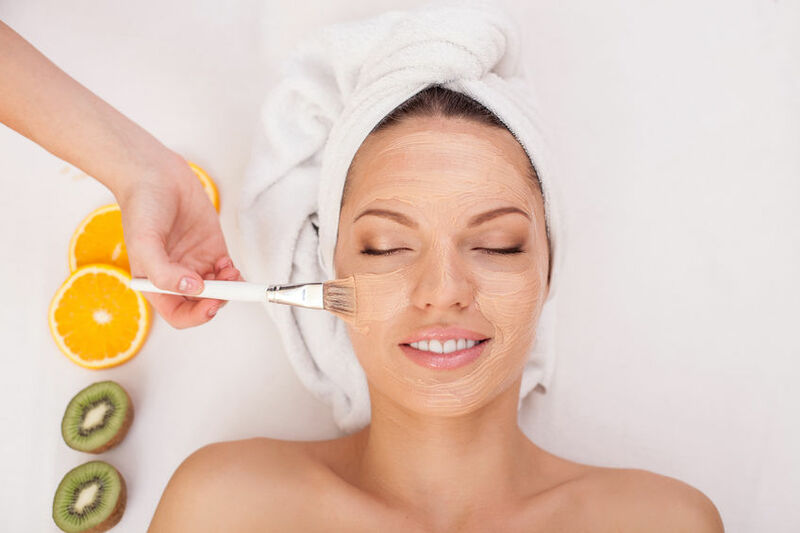 "This way, you'll have a baseline for what they looked like before and you won't worry yourself unnecessarily," says Maritza I. Perez, dermatologist at Advanced Aesthetics in New Canaan, Connecticut, and director of cosmetic dermatology at Mount Sinai Westin New York City. These skin checks are especially important to do before trying to conceive, since recent research shows that melanoma is more aggressive and deadly in pregnant women. A January 2016 study found that women who were diagnosed with malignant melanoma during pregnancy or within a year of giving birth were more than five times more likely to die and nearly seven times more likely to have the cancer spread to other parts of the body. Although researchers aren't sure why, hormonal changes during pregnancy, such as higher levels of estrogen, are likely fueling the cancer. Have any moles and skin tags removed. "If you want any moles removed, do it now or wait until after you've given birth," says dermatologist Karyn Grossman of Grossman Dermatology in Los Angeles and New York City. Even though removing a mole is a minor procedure—the area is numbed and then the mole is typically shaved off—there's a risk of infection and bleeding, which most dermatologists see as an unnecessary gamble if you might be pregnant. The same goes for skin tags, those fleshy, benign growths that can crop up around your neck and eyes, and under your breasts. "You may want to get the ones you already have removed before conception," says Dr. Perez. That's because skin tags will likely increase and possibly grow larger during pregnancy. To remove them, a dermatologist can inject a numbing agent into the spot and then either cut or freeze off the skin tag. Say goodbye to wrinkle-fighting retinoids for now. The gold standard anti-aging treatment is a no-no both when you're trying to conceive and when you become pregnant. "Definitely stop retinoids of all sorts: prescription Retin-A, Differin, or Tazorac, and over-the-counter retinol," says Dr. Grossman. Even though only a small amount is absorbed into the skin, topical retinoids may be harmful to the fetus. According to a 2011 study, the retinoid acid tretinoin has been linked to birth defects. "It's also important to check the labels of any anti-aging, anti-acne, and anti-pigment products, as these may have retinol as an active ingredient," adds Dr. Grossman. But just because retinoids are out doesn't mean you have to put up with fine lines and dull skin while you're trying to get pregnant. Instead, talk to your doctor about a daily antioxidant serum, such as SkinCeuticals C E Ferulic ($162), which softens fines lines and brightens and firms the skin. Dr. Perez recommends using a moisturizer with peptides, such as Olay Professional ProX Anti-Aging Wrinkle Smoothing Cream (around $40), which safely reduces wrinkles. Switch to safer, gentler versions of acne treatments. Acne-fighting staples salicylic and glycolic acids should go to the back of your medicine cabinet for now. As with retinoids, only a relatively small amount is absorbed into the skin, but there isn't enough research on the active ingredients' effects on pregnant women to classify them as completely safe. So dermatologists err on the side of caution by recommending that pregnant women or those trying to conceive avoid them altogether. Dermatologists' opinions are mixed regarding whether benzoyl peroxide is safe when you're trying to conceive or are pregnant. A 2011 analysis points out that no studies have been conducted on topical benzoyl peroxide use during pregnancy but that, because such a small amount is absorbed through the skin, it's unlikely to pose any risk to a developing fetus. Although you should always consult with your obstetrician first about products you're using, Dr. Grossman typically allows her trying-to-conceive patients to use benzoyl peroxide in low concentrations, such as 2.5 percent, and only in cleanser form. "Cleansers are wash-off products, so there is less long-term contact with the skin and presumably less absorption into the skin," she says. Or consider a natural solution for blemishes: niacinamide, which is vitamin B3. The vitamin has anti-inflammatory properties that can help reduce acne flare-ups, according to Dr. Perez. Bonus: Research also shows it reduces hyperpigmentation, softens fine lines, and improves skin elasticity. Talk to your obstetrician about taking niacinamide as a vitamin supplement or in topical form. If your acne requires a more powerful treatment, your dermatologist may prescribe certain oral antibiotics, such as erythromycin, or prescription azelaic acid (Finacea), which are generally considered safe to use both while trying to conceive and during pregnancy when taken in the recommended amounts. Start a prevention plan for melasma now. Slathering on sunscreen every day is a given, but it's especially important to stick with it when you're trying to get pregnant (and when you already are). That's because sunscreen helps blocks the ultraviolet light that can trigger and worsen melasma, a common type of hyperpigmentation that shows up as dark patches of skin around the mouth, cheeks, and forehead. Some women who are trying to conceive or are pregnant feel more comfortable using natural physical sunblock, which reflects UVA and UVB rays with minerals zinc oxide and titanium dioxide. Drs. Grossman and Perez both recommend using a physical sunblock with SPF 50. Just be sure to reapply every two hours you're in the sun and wear a wide-brimmed hat for added protection. Schedule your last Botox session. Elective treatments, such as Botox or injectable fillers, are off-limits when you're pregnant. There's simply not enough research to show whether it's safe to get either wrinkle-erasing treatment when you might be pregnant, according to the FDA. "So if you're already getting those treatments done, schedule the last one right before you start trying to conceive," says Dr. Perez. Or wait until you get your next period: "I tell patients if they are trying, they have their period, and want Botox or fillers, we will do a urine test to confirm that they're not pregnant before doing the injections," says Dr. Grossman. Hold off on any varicose vein removal unless it can't wait. If you have a vein that is bulging and tender or painful, have it examined by your dermatologist and possibly treated before trying to get pregnant, suggests Dr. Grossman. But if you have unsightly veins on your legs that you want removed simply for cosmetic reasons, hang on until after baby arrives and after you've stopping breastfeeding. "You may have more veins after pregnancy, so it's totally a waste of time to remove them now," says Dr. Perez. In the meantime, when you do become pregnant, Dr. Grossman recommends wearing compression stockings, which help prevent swelling and keep the veins from worsening.